This Work is part of a set in the "Waterfall" series displaying a fast water rivlet winding its way across the first of the earth's bones, the stone layer washed clean by the fall-lines of water-drop before cloud masses pass over the Appalachain Mountains. This is the Artist's heartland, the mountains of southern West Virginia, which she knows intimately from childhood. This piece captures the freshness, colors, secrets, the very life force of these mountains. Earnest's technique is equally mysterious and superlative. A rare thing to see this depth of blue-green on gossimer transparent china silk. The artist uses her knowledge of chemistry to effectively set the depth of color required to execute contrast necessary to capture the fragility and quiet freshness of the scene. Majenta blossoms on the rhododendron are characteristic of the southern Appalachain Mountains flora. 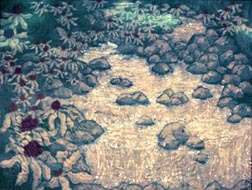 This half of the "Waterfall" set is one of the artists favorite Works. Probably because of the sweetness of the rhododendron buds in their winter aspect. The mist of origin in the background marks the transition from cloud vapor to water's precipitate flow through the wood. The exquisite and delicate color is 'reserved' here as a pre-spring atmosphere, containing its vail, when thermal inversions press the cloud against the earths warmth causing the waters to condensate, thus the name, "Source". 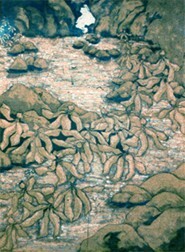 The artist believes this Work captures the very "Spirit" of the mountain. This watercolor series titled "Spirit Changes" is a study of one person. It shows how countenance changes over time and relationships. It illustrates the dynamic of transitions between our emotional states; the writing of the soul's content on our faces, posture, persona, reflecting introspection, revealing visually our spiritual passages incarnate. These detailed anatomical studies illustrate the actions of our spiritual content, displayed just as we read one another by those non-verbal visual markers, body language and facial expressions, communicating with each other as we interact. **This series has not been shown and is now available for exhibition to interested gallery or museum. Please contact the artist for more information and booking.